The Department of Energy calculates that heating and air conditioning account for nearly half the energy used in a typical home. It can be as much as 56% of your overall utility costs. That’s more than all the light bulbs, the dishwasher, the refrigerator, the hot water heater and the washer and dryer, combined. The more efficient your heating and cooling system is, the less energy it will use. 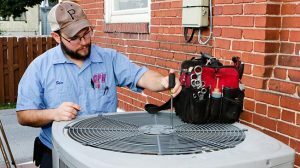 Whether you’re using heat pumps or a window air conditioning unit, it’s important to keep your heating and air conditioning systems well maintained. There are many ways to cut costs for heating and cooling your home. Some require an up-front financial investment to realize significant, long-term savings, while others are simple and free! 1. Regularly scheduled maintenance. Have your heating and cooling system inspected every six months. Better yet, sign up for regular preventative maintenance to make sure your system is always operating at top speed at the lowest cost. 2. Have a programmable thermostat installed. This helps regulate indoor temperatures for a small up front investment (as low as $200 not including installation). This can save as much as 12% over the year. 3. Replace outdated, “low-SEER” heat pumps with newer, higher-efficiency heat pumps. This is one of the best ways to reduce costs and many HVAC contractors offer competitive payment programs or ways to use state and federal rebate incentives. 4. Go mini! If you have window AC units, consider upgrading to high-efficiency, low cost and maintenance ductless mini splits. Mini splits provide spot heating and cooling for single rooms or whole homes. 5. Change the filters on your air conditioning unit and dust the coils regularly. This will help the system work more efficiently. 6. Get an energy audit. We’ll come to your house and review your overall energy usage and make recommendations on where you could save on costs. Call 717-738-0760 to learn more or to schedule a home energy audit with us. Energy-efficient light bulbs often cost several dollars more than standard light bulbs, but pay for themselves in about 3 years. Caulk around windows and weather-strip doors to prevent conditioned air from leaking out. A $3 tube of caulk can make a big difference. Use window curtains or shades to keep out the sun during the heat of the day. Cook on an outdoor grill or use an electric crock pot to avoid using the oven. Cut your daily shower from 15 minutes to 10. You’ll save water and electricity. If you use an electric water heater, reduce the temperature setting to 120 degrees. To learn how you can save money on your heating, cooling, and water costs each month, contact Cocalico Plumbing & Heating today. Our technicians can walk through your house and offer you cost-saving suggestions for improving your home.